The 26-year-old Dutchman won the last four legs of a high-quality final to claim the £65,000 first prize. 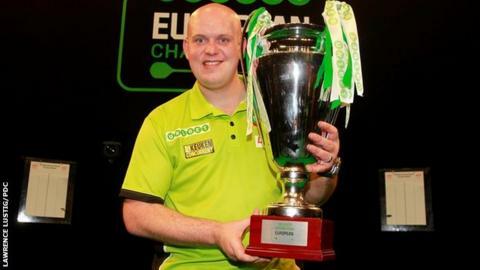 Van Gerwen also missed a double 12 for a nine-dart finish in the fourth leg of Sunday's final in Hasselt, Belgium. "Maybe I played the four best legs of my career under this pressure and I'm really happy with that," he said. "It's fantastic to win a tournament like this in that way." Scotland's Anderson, 44, had looked certain to add the European title to his World Championship and Premier League triumphs earlier in 2015 when he led 10-7 in the final. "It was there for the taking," said Anderson. "I threw that away but Michael came back well."